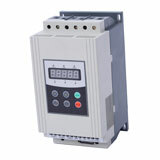 AC motor soft starter Choose a different starting modes and parameter settings according to different loads characteristics to achieve optimum effect. The soft starter has three starting methods: Voltage ramp start - get the maximum output torque; Current limitation start - limit starting current effectively; Jog - to achieve debugging test. 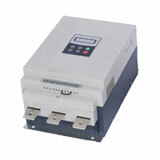 Motor soft starters These intelligent motor soft starters are manufacturing under power electronics technologies, microprocessor technologies and modern control theory technologies, it's an up-to-date international advanced starting device. These soft starters can restrict induction AC motor starting voltage effectively during motor start-up period, which can be widely used in fans & pumps, compressors and other heavy load equipments. Applications: Pumps, Fans, Ball mill, Compressor, Belt conveyor etc.